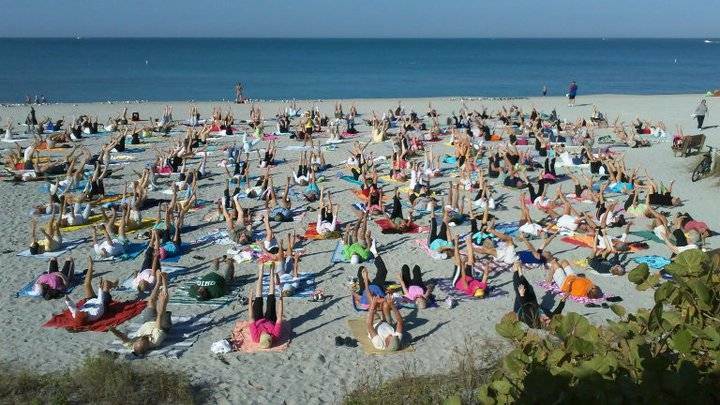 Balance, Breathe, Strengthen and at the same time, Relax on Venice Beach, Florida. The focus of “Free Yoga With Elin” everybody can do yoga. Join our free yoga classes with Elin today! Yoga brings you to your full range of motion – not pushing beyond your limits. Move the way your body is designed to move. Learn to safely maneuver through your back, shoulder, and knee issues. Yoga is for all abilities. Increase your energy and learn how to breathe as nature intended. Yoga classes with different levels to fit everyone’s abilities and needs–including beginners who have never practiced yoga before and students with disabilities. Baby boomers that stay active have a higher chance of remaining more independent and able-bodied into their golden years, according to experts, and yoga is quickly becoming a popular means for older folks to stay fit. Elin, a certified yoga instructor who brings her unique style to Yoga with Elin – Venice Beach Florida, to share with all. Her goal is to provide an environment where people feel comfortable and safe to practice this incredible discipline. Sunset yoga, most evenings call or go to website for times. Times change with the seasons.